Weight increment - .05 lbs. The CubiScan 100, an integrated cubing and weighing system, gives you total control in any distribution center or warehouse application. Imagine the benefits of collecting your package information (weight and size) quickly and consistently–there’s no need for second guessing, no room for human error, no reason to re-enter data, and no data corruption. And, the information is easily transferred to your data processing system where it can be used immediately. Mobile Cart, and 12v battery included, computer not included. This is located in our Edison, NJ warehouse. This has been used recently and is in good working order. 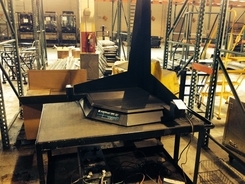 You'll love what this can do for your facility.